Chemotherapy has become a commonly used term and most people know that it helps to treat cancer and prevent a cancerous tumor from growing. But many people have no idea how chemotherapy works to keep cancer at bay. In order to understand how chemotherapy works, you’ll need to understand the basics about cell division. 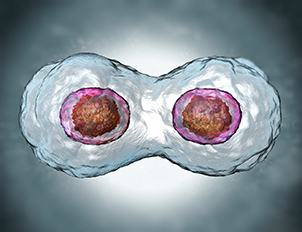 All cells undergo a process called mitosis, or cell division. The cells in fetuses and infants are undergoing mitosis at a very fast rate, whereas most of the cells in adults only undergo mitosis when they need to repair damage. Cancer cells, on the other hand, divide much more often than normal cells. In fact, they undergo mitosis so often that they eventually grow large enough to form a lump, or tumor. Chemotherapy actually targets cell cells that are in the process of dividing, often killing them. Because cancer cells undergo cell division much more often than normal cells, chemotherapy usually ends up killing cancer cells while leaving the rest of the body’s cells unharmed. There are some non-cancerous cells, however, that divide extremely quickly. For example, hair cells are constantly replenishing themselves and growing. That’s why chemotherapy often causes hair to fall out; the chemotherapy targets the constantly growing hair follicles and kills them, as well as the cancer cells that it is intended to target. Now that you understand how chemotherapy works, you can easily understand other side effects of chemotherapy. Other cells that undergo cell division regularly include bone marrow cells, skin cells, and cells in the lining of the digestive tract. That means, for example, that the chemotherapy may kill healthy bone marrow cells along with cancer cells. Since bone marrow produces white blood cells that are important to the body’s immune system, chemotherapy treatment may kill off some of the bone marrow cells, necessitating a bone marrow transplant. Since cells that line the digestive tract multiply on a regular basis, they also may be targeted by chemotherapy agents. This can lead to intense nausea and problems with the digestive system in chemotherapy patients. Although chemotherapy treatment cannot always completely destroy all of the cancer cells, it can sometimes help when combined with other treatments options. For example, a patient with breast cancer may require surgery to remove the cancerous tumor, but chemotherapy can help to reduce the likelihood of the cancer returning. Even for some cancers that are incurable, an oncologist may suggest chemotherapy in order to shrink the tumor, relieve the symptoms of cancer, or prolong the patient’s life by keeping the cancer under control for as long as possible. In some cases, chemotherapy drugs can help put a patient into complete remission, in which case the cancer cannot be detected at all by using scans, blood tests, or other testing methods. This does not mean that the cancer is gone for good, but it does mean that the cancer is no longer harmful for the time being. In other cases, the goal is for the patient to achieve partial remission, in which the cancerous tumor has shrunk or stopped growing. Sometimes this can enable other treatments to help, such as radiation or surgery. © Breast Doctors Houston, All rights reserved.